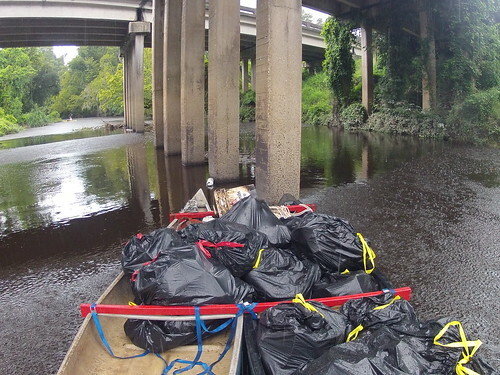 Since the beginning of Paddle Baton Rouge, we have had but one canoe on our many cleanups. That all changed in time to tie together a paddle train to haul the loo from Bayou Fountain last trip, but the time had come to go even better. It was time to create the Canoemaran. Fast forward through a day of building and testing, and you end up with a set of three wooden crossbars, seven straps, one tripod-and-storage tray, and just a few paint splotches here and there. Also, when all those (save the splotches) are put together, you have a fully-operational canoemaran. Woo-hoo! 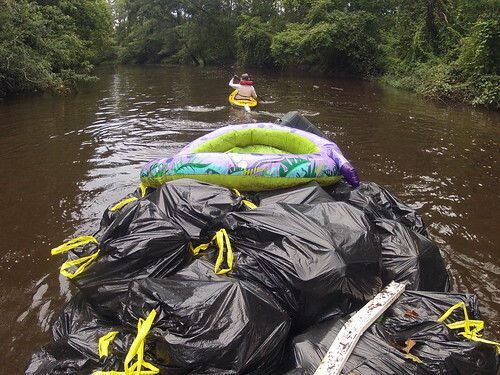 With the recent rains still producing a lingering bit of current, towing the Canoemaran was a bit more effort than it would normally be on Bayou Manchac. We only averaged about two miles an hour on the way upstream (true speed, documented by GPS tracklog), but that wasn’t bad considering. 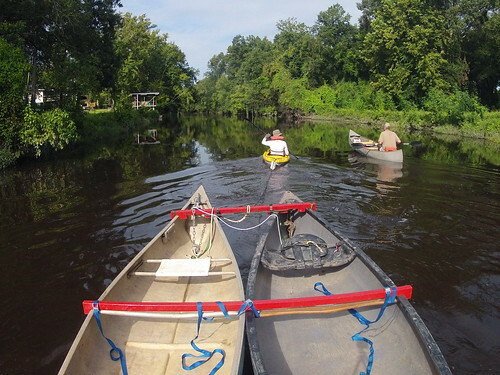 Towing the unladen Canoemaran was not unduly difficult, and Jonathan was enjoying the trip paddling with various paddles, sitting and even standing. 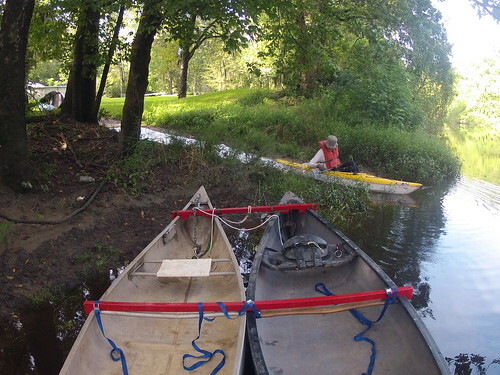 Upon arriving at the Ward Creek confluence, the Canoemaran’s anchor was set and the cleanup began in earnest. 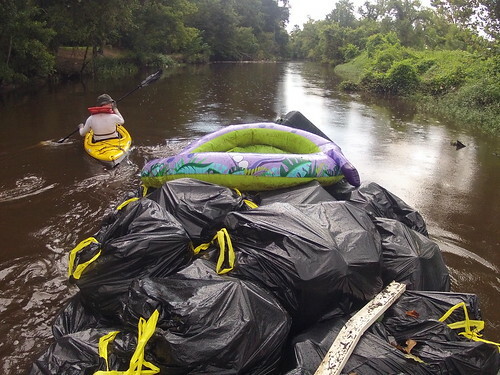 As often happens, some of the litter raft of the previous trip had apparently broken free to head down Bayou Manchac, but there was still quite a large amount at hand, primarily in two large concentrations. 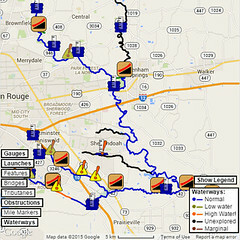 After polishing off the confluence area, we continued downstream back toward Jonathan’s launch. We’d haul up the anchor, paddle down to the next litter concentration, and drop anchor. 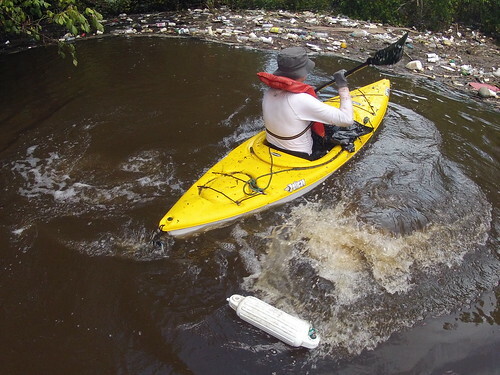 Jonathan took to the strainers, and I paddled the vicinity picking up stray litter from the banks and smaller concentrations. Once it was cleaned, up with the anchor and onward down the bayou. Eventually, Jonathan had to head back, but as the Canoemaran still had plenty of room remaining, I elected to stay back and keep working. I’d hate to prematurely conclude the maiden voyage while there was plenty of litter remaining and space to carry it, after all. On the other hand, it was getting to be a bit warm. Thankfully, a pleasant little rainstorm dropped by, cooling me considerably (and leaving an inch or two of water in the bottom of the Canoemaran). 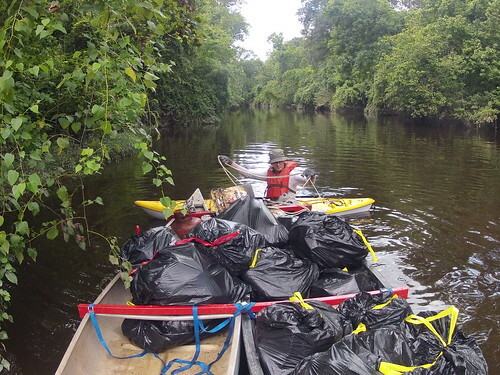 The cleanup continued past Airline Highway, and around 1000 feet downstream of that bridge, there’s a chicane with two strainer trees catching a *vast* amount of litter. I anchored the Canoemaran and went to work. 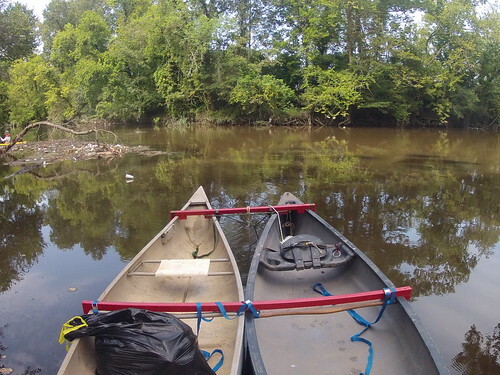 I did not see any sign of the snake I’d seen slinking through the upstream of the two litter rafts as we made our way upstream hours earlier, but it’s wise to be reasonably careful whenever you’re outdoors in Louisiana. 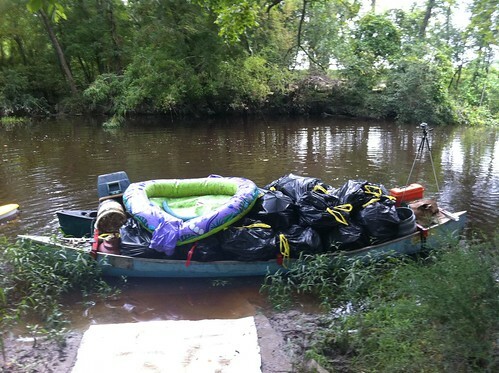 When I’d more or less finished the upstream litter raft (after about an hour’s work), I started work on the downstream one (which was much, much larger). I really wish I’d had a pool pole or at least a rake, as the litter under the tree and vines was virtually unreachable. There was plenty to be had without working far into the foliage, however, and that provided more than enough litter to grab. After not quite another two hours of work, the Canoemaran was quite respectably loaded, and exhaustion was beginning to set in. Also, a thunderstorm was making its voice heard, and getting back before dark seemed like a good idea (or else how would we get some nice photos of the results, eh?). I pulled anchor and started downstream (but only after making one last grab into the foliage to retrieve a purple dinosaur inflatable kiddie pool — who could leave *that*?). 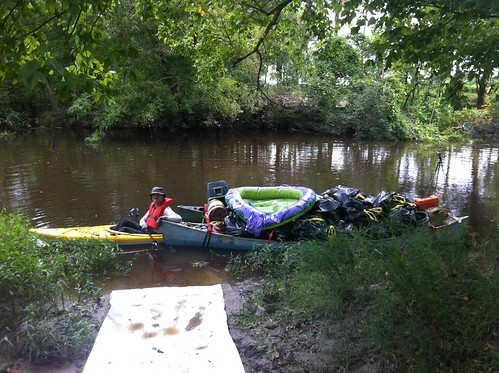 At last, the Canoemaran trek reached its destination back at the launch point. We offloaded all the litter (31 bags, plus various larger objects) onto a trailer Jonathan pulled down to the launch, and the Canoemaran was disassembled and loaded onto the waiting canoe trailer. All in all, quite a day. All in all, a great day on the bayou, and there’s plenty more out there where this came from.